Patriot. Rabble rouser. Spirited orator. Not George Washington. Pardon all the words – but sometimes history needs all the words it can get its hands on. Today and for the rest of the week, I’ll be presenting “Frenemies: Tales of Presidential Friends Becoming Presidential Foes” in three parts. 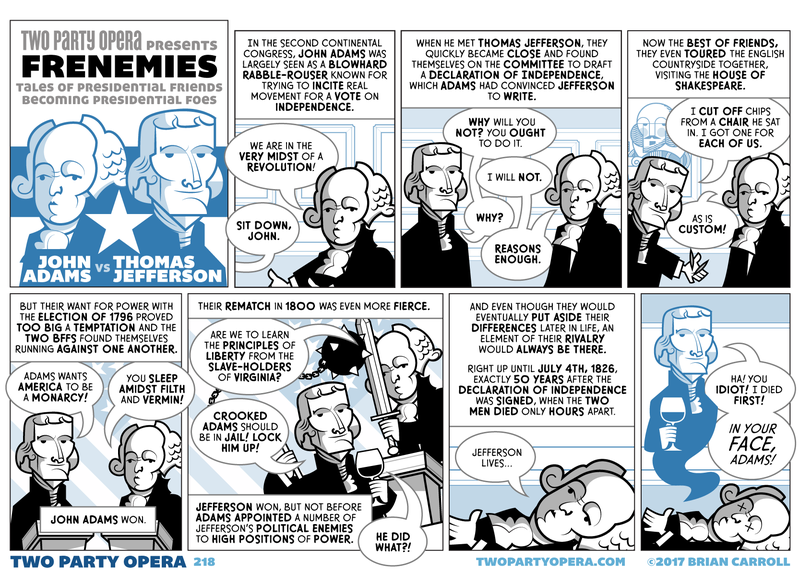 By the way, I know John Adams is known for being obnoxious and short-tempered, but this doesn’t actually seem to be based in any sort of first-hand accounts of the man. The only real mention of him being difficult to work with are from Adams’s own accounts describing himself. I could be wrong about this and would love if someone knows more about this to point me in the right direction, but it seems like of all the depictions of him in movies and musicals, Adams’s authored his own modern depiction. That all being said, John Adams was one of the greatest Americans we’ve probably ever had. Right up until he became president when it started going downhill, but that seems to be true for most good men who become president.